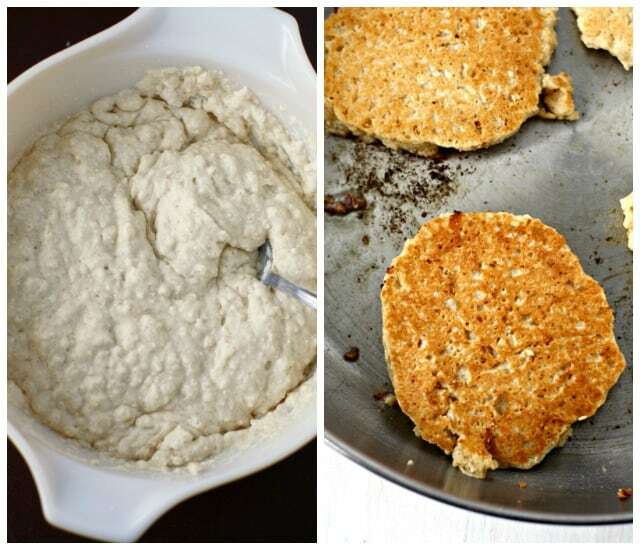 Home » Breakfast » Deliciously Easy Dairy Free Pancake Recipe. This dairy free pancake recipe makes the perfect stack of light and fluffy pancakes – just right for a Saturday morning! These are so delicious with maple syrup or fresh fruit on top! Do you remember eating pancakes when you were growing up? Pancake breakfasts were such a fun weekend tradition at our house. Of course, we used a store-bought mix, and regular milk and butter. That just won’t do for us anymore! We still love our weekend breakfasts, but now we enjoy a big stack of dairy free pancakes with vegan buttery spread and warm maple syrup. Family breakfasts are a great start to your weekend – there’s nothing like sharing delicious food with your family! 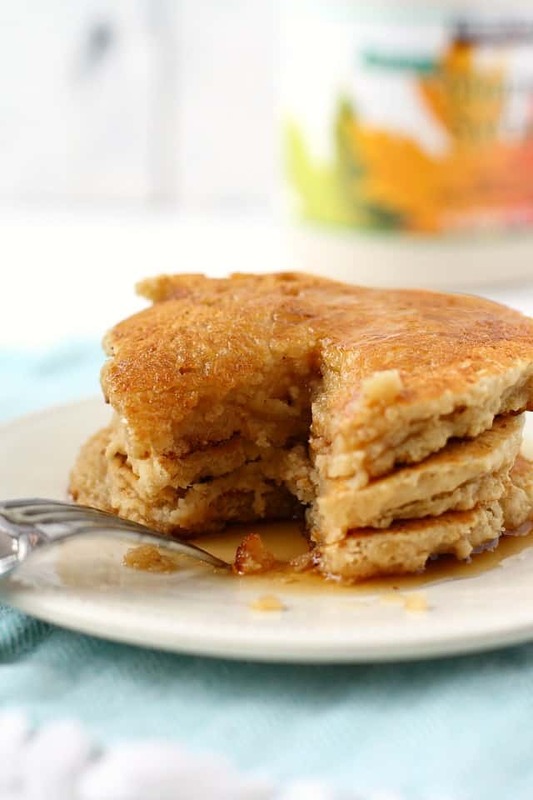 Yes, you can have flavorful, fluffy, light pancakes made without dairy and eggs! This dairy free pancake recipe is so good, no one will even guess that it’s free of milk and eggs. And for those who like to make a lot of pancakes and serve them throughout the week, you can save these in the refrigerator for up to five days. 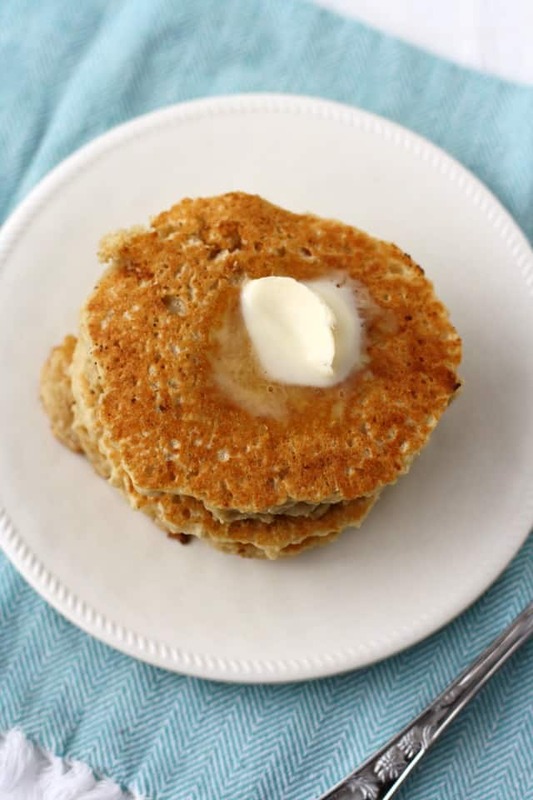 This dairy free pancake recipe uses a variety of flours for added fiber and flavor. 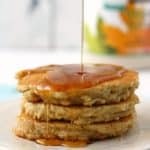 I love the idea of including oatmeal in pancakes, but since my boys don’t love that texture, I grind the oatmeal in the food processor before adding it. You could also use oat flour if you happen to have that in the pantry. Spelt flour is a healthy choice for pancakes, but you could use whole wheat flour if you prefer. Top these milk free pancakes with warmed maple syrup or fresh berries. You’ll love how light and fluffy these are! What type of non-dairy milk is best for making pancakes? You can use just about any non-dairy milk that works for your diet. I prefer to use So Delicious Unsweetened Coconut Milk, but I have used soy milk and almond milk in the past. Flax milk, oat milk, or rice milk would work as well! If you’re in a pinch, you could use water. How do you make dairy free pancakes? Add the dairy free milk, and let the batter rise for a few minutes. It will look puffy, like the photo below. Fry the pancakes in some vegan buttery spread over medium heat. Take your time, and don’t raise the heat too high. You don’t want to burn them! How long can you store these milk free pancakes in the refrigerator? These can be kept in the refrigerator for up to 5 days. Can these pancakes be frozen? Yes, you can freeze these pancakes! Store them in a freezer bag for up to three months. Is that the correct amount of baking powder? It seems like a lot. Yes, 1 1/2 TABLESPOONS is the correct amount! The baking powder is what allows these pancakes to rise and become very light and fluffy. These dairy free pancakes are light, fluffy, and delicious when topped with warm syrup or fresh berries. Cuisine Dairy Free, Egg Free, vegan. Grind the oats in the food processor until a fine flour is formed. Place the white spelt flour, whole spelt flour, ground oats, baking powder, and salt into a large bowl and whisk together. Set aside and let the batter rise for a few minutes. Place some vegan buttery spread in a frying pan and heat over medium heat. Once the buttery spread is sizzling, spoon some batter into the pan. Let the pancakes cook for about 3-4 minutes, until the edges look done before flipping. Cook on the other side for another 3 minutes until golden brown on both sides. Add more vegan buttery spread to the pan and cook the remaining pancakes. Serve with vegan buttery spread on top, maple syrup, and fresh berries if desired. You can store these pancakes in the refrigerator for up to 5 days. These pancakes can be frozen for up to 3 months. Just store them in a freezer bag. Nutrition facts are for one pancake. If you love making breakfast, you’ll want to try this recipe for blueberry pancakes or this pumpkin chocolate chip pancake recipe. This post was originally published in June 2016. It has been updated. « Super Tasty Garlic Roasted Broccoli. This is awesome! I love it love it love it! These look amazing! Do you think I could use half spelt flour and half oat flour? These look so thick and fluffy and delicious! Yum! These pancakes look like the perfect weekend breakfast! I like your idea of grinding up the oats to smooth out the texture a bit. And I definitely want some of that blueberry sauce on mine! I love multigrain pancakes and yours are seriously making me DROOL, Kelly! Love that blueberry sauce and love how fluffy and tender these look! Mmmmm these look like the perfect weekend breakfast! That blueberry topping is driving me bonkers! 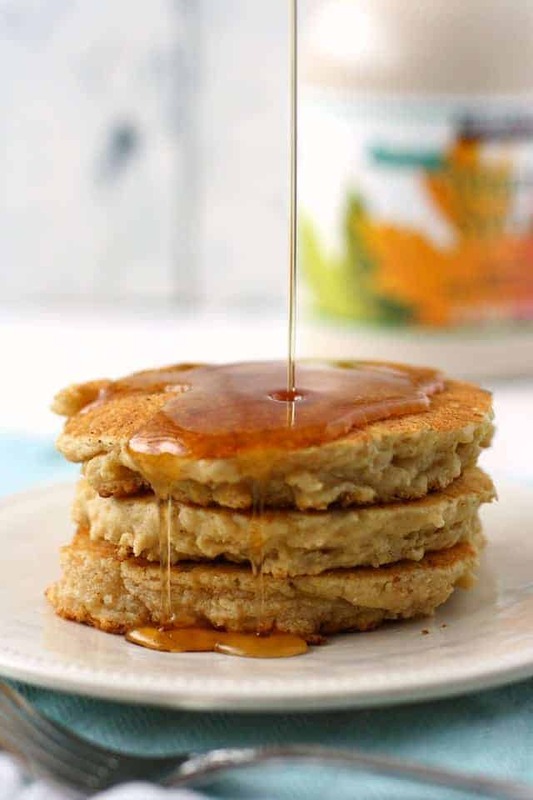 I’ve been craving all the pancakes lately and am dying to try this vegan version! Very inspired!